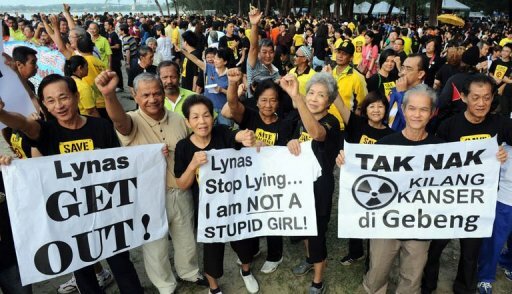 Thousands of Malaysian protesters rallied on Sunday against plans by an Australian mining company to open a rare earth processing plant in an eastern resort town, saying they fear it will harm the environment. In one of the largest rallies in years in Mogadishu, thousands of Somalis packed into a stadium on Sunday to denounce the Shabab Islamist group for the suicide bombing last week that killed scores of people, many of them students. More than 2,000 people protesting potential cuts to the national health care system staged a sit-in on Westminster Bridge in London on Sunday afternoon, blocking traffic on one of the city’s busiest bridges. Dozens of preachers from mosques across Morocco protested Monday in the capital over tight controls on their preaching, the first time such a demonstration has been allowed to go forward. Bulgarian protesters marched on the nation’s capital, Sofia, on Sunday, chanting slogans against the government’s plans to start exploiting shale natural gas deposits. WikiLeaks founder Julian Assange and socialite Jemima Khan led a protest in London Saturday against the start of the 10th year of war in Afghanistan. Organizers of the Stop The War Coalition claimed 5,000 people attended the protest in central London’s historic Trafalgar Square. Thousands of women gathered in the southern Yemeni city to celebrate Tawakkol Karman, the first Arab woman to win the Nobel Peace Prize. Demonstrators also called on the international community to support a revolution in Yemen. At least 38 women were injured by rocks and batons when pro-government gangs attacked Sunday’s march.